welcome to my brain . 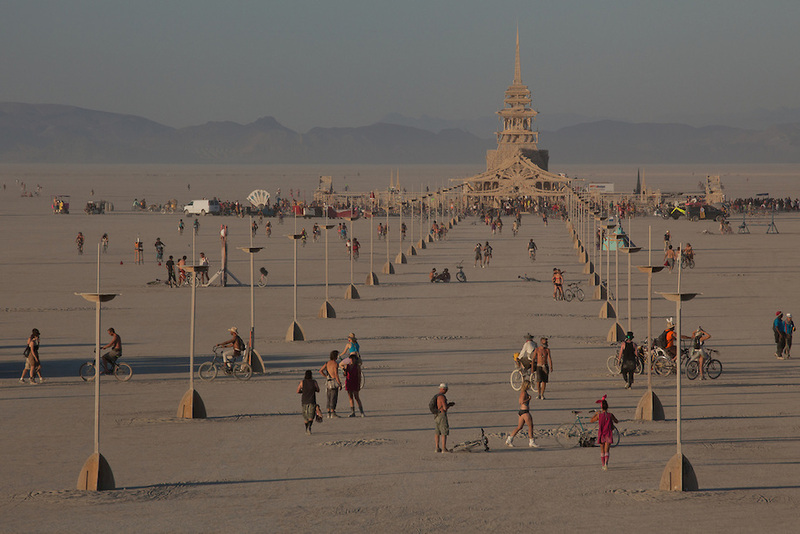 net: Burning Man - "The Temple gets it right." Burning Man - "The Temple gets it right." The Temple at Burning Man has a twelve year history. It's always big and beautiful. This year's Temple of Juno was a little gift for my eyes and my heart. I loved it. I loved every single thing about it - all that it has been and all that it was this year. I discovered early on that every single other person has their own opinion. I can't say "they either loved it or hated it." Everyone was all over the map. Some people saw it as art. Some saw it as sacred. Others felt it forced itself as a tradition that was not invited. Many were turned off by the spirituality it held for others. Some were just ... eh. I heard a large number of voices celebrate the openness it could be to everyone for whatever need or pain or loss or celebration. Mmm hmmm. That right there is why I loved it. Yet, it became so much more for me. I lost a friend a few months ago. I had planned to see him while at Burning Man. What I had not planned for was to see his pictures and his boots memorialized in the center of The Temple. I certainly had no idea I would connect with a mutual acquaintance and be able to share that moment with a virtual stranger. This is someone, of course, I now consider a friend. Last year's burn was supposedly one of the best years of weather on record. So, I was actually looking forward to lots of dust and wind and really having the full experience that is playa dust. I didn't expect I would spend my first whiteout, following my new friend on our bicycles, barely able to see a few feet in front of us. It wasn't his first rodeo, and we trudged along until The Temple slowly appeared out of the thick clouds of earth. That was phenomenal! Not too long after we took off into the blinding nothingness, Pat asked, "Are you doing okay?" I don't remember exactly what I said, but I'm pretty sure it included a string of words like: fantastic, amazing, best day ever, holy CRAP, you just made my decade, wowza, and maybe a spattering of "!*^%!!*!" That entire day is still one of my favorite memories from this year. All of it: the whole way there and two strangers connecting in the middle of the desert and the whiteout drenching the air every second we sat and talked and remembered him - I think my friend Ron would have loved it. It made me so very happy. Taking some time to remember our friend, Ron. My 70-something neighbor told me, "The Temple gets it right. So many of us out here don't have a place to grieve." He talked about how there are so many who need a process and a place and a ritual when they lose someone. Yet, what is dictated by their families or organized religion does not embrace who they are, how they feel or what they believe. The Temple does. It embraces all of it. "It teaches people how to grieve in a healthy way," he said. "It gets it right." One older camp mate began to talk about a memorial she created for her dog. Tears welled up immediately. She apologized and said, "I know it's silly. It's just a dog," as she wept. I scootched my chair close to her and said, "No ma'am. Not silly." This was a deep loss for her, and I'm assuming there were not a lot of people in her every day life that were helping her to create a space that matched her level of grief. "Tell me about your dog." And she did. She also told me how she had returned to The Temple the night before. A man was sitting in front of the area she had created for her pet. She meandered and continued to check back, but he was still there. So, she finally walked over and explained how she had come to spend some time remembering her little bundle of sweetness, and asked if he wouldn't mind moving a little. Not only did he move over, but he sat and asked her questions, listened to her story, wrapped his arms around her and held her as she cried. The Temple gets it right. What that means is: The Temple is just the space. The people come to the space and make it what they need it to be. Praying, chanting, crying, laughing, dancing, meditating, sounding of shofars, napping, writing, singing bowls, singing voices, silence, cheering, group rituals, etc. It is beautiful and intricate and slowly covered in words and pictures and items and more words and drawings and more items and more pictures and more words. A place to work through the process of pain and loss. To find some peace and closure. One more step in moving forward while refusing to forget. My first visit to The Temple was at night. The details in the moonlight were overwhelming. I found myself wanting to scream, "Don't do it!" It was just too beautiful to burn. And yes, that's when it hit me. All of it. I mean, I get the idea of impermanence. Yet, I hadn't yet felt it so deeply connected to the death of someone or something. I had slowly walked every inch of The Temple and scanned all of the pictures, stopped to read some of the words, written many of my own ... all of these people and dreams and animals and loves ... all of them were just as beautiful as The Temple. All of them took the breath away from someone on this planet just by existing. So, instead of feeling the panic of the loss that was going to occur in just a few days, I leaned into the present. I leaned into The Temple. I touched a few of the details. I memorized a few things in my mind's eye. I enjoyed it and let it feed me while I had it. 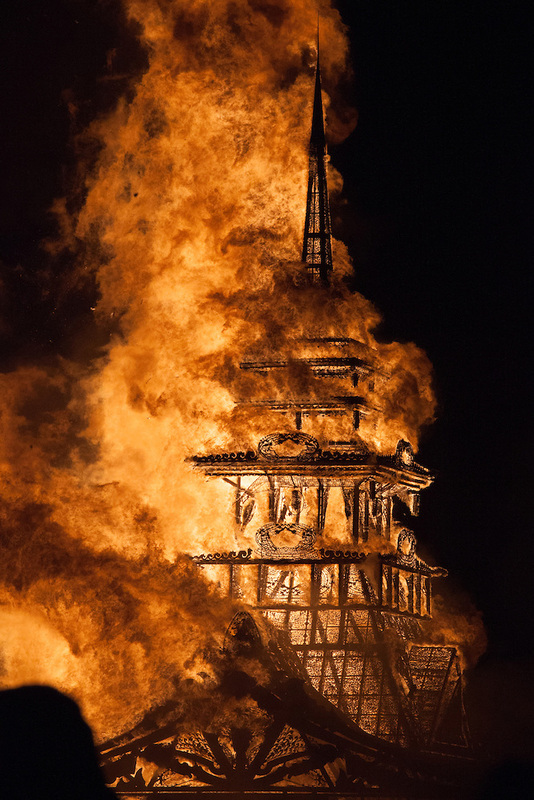 Traditionally, the night of The Temple burn is solemn. Most want to watch it in silence. Every year, there are people who ... don't necessarily facilitate that experience. Understandably, those who are grieving have very strong reactions. Imagine having a sloppy drunk show up at your grandmother's funeral singing the theme to The Brady Bunch from the back of the room. It would feel ... well, there are no words to describe how disrespectful that would feel and how quickly the anger would well up. Yet, even those people have a reason for what they're doing. 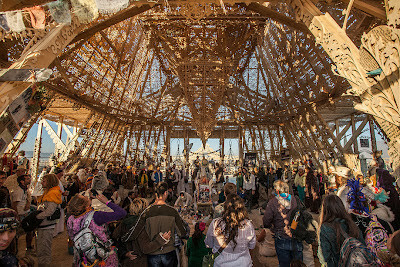 Maybe they really are new to the entire experience of Burning Man and didn't actually read, learn or hear what most of the community is wanting during that time. Some of them are just completely inebriated and have lost their filter. Maybe they are either painfully uncomfortable, or their own big feelings about life and death are spilling over. Instead of anger or another strong emotion, it comes out as silly or joking. It is a city of 50,000+ people and everyone is invited to the memorial service, so to speak. It will always be a part of how it plays out. Regardless of the few who break the silence, it is one of the quietest experiences on the playa. You can hear the soft weeping through the crackling of the flames. People occasionally yell out words of love and remembrance to those they lost. 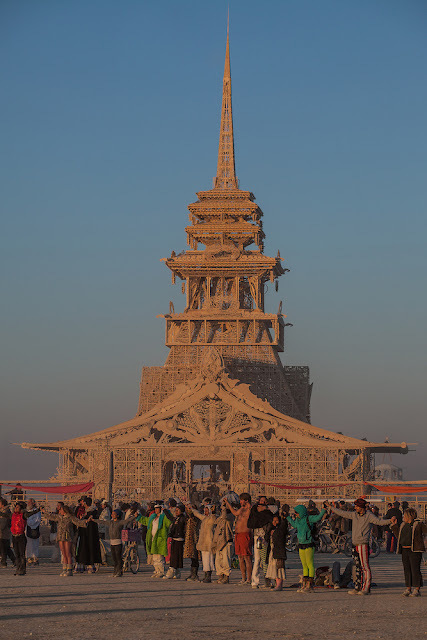 This year, as The Temple crumbled, a small flock of white birds broke through a large, thick cloud of smoke. One of those tiny moments you know to grab and hold and enjoy ... as it flies away. I have had a difficult time with grief most of my life. Many times we lose someone and others immediately say and do things that either lessen our pain or encourage us to bypass the most gut wrenching parts. In the institutionalized church, I watched people lean heavily toward "celebrating a life" at the expense of "weeping, moaning and crying your ever-lovin' eyeballs out." Grief can make us extremely uncomfortable, so much so that maybe some of us have been the drunk singing loudly at the back of the room. Maybe it just looks slightly different. Maybe we try to smooth things over too quickly. My heart exploded every time I sat in that space and watched people grieve in hundreds of different ways throughout The Temple. I even enjoyed the guy napping in the corner while trying to stay out of the worst of the whiteout. Heck, I got to sit and remember my friend while watching a wedding happen just a few feet away. Indeed. The Temple gets it right. Cesar, I'm so glad I've been able to articulate it for others. It's a giant ball of "where do I start?" Thank you. 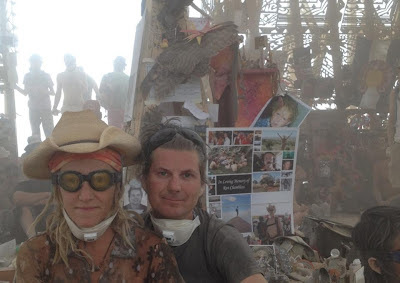 I didn't understand what exactly the temple or the memorial there for my nephew, Ron was all about, nor what Burning Man is about, for that matter. Your description was helpful and very moving. I am so glad this was a help to you. This kind of openness and love and thoughtfulness can certainly help you see why your nephew was drawn to Burning Man. He was all of those things. Just as beautiful as that Temple. Everyone wanted him here longer, but we were wonderfully blessed by him in the time we did have. Christine- thank you. 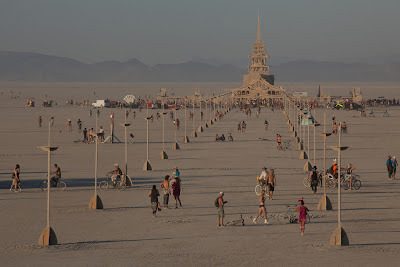 I had never heard of Burning Man until I started reading your blog. I'm crying my own tears of grief after my 5 year old foster son of 18 months came and started asking questions about returning home. It's heartbreaking. And you describing your experience gave me the permission to feel what I'm feeling. So gorgeous and heartbreaking and true. *sigh* I feel better just reading it, I feel exactly what I would have felt if I could have been there. I have been "celebrating" my various griefs for 10 years, and am always so comforted when I find people who can bow their heads in the beauty of it along with me. Thank you for this! I'm gonna need to read this multiple times. I lead a general grief group at my church. I try and balance the "organized religion" and the need to grieve, memorialize, and integrate. I feel so sad when people want to skip to the "glorious testimony" portion of how Jesus healed their grief, but they don't want to go through the actual process to get there. I get the desire, I've lived the desire, but that's not the journey I was taken on. So I'm always on the lookout for non-threatening things I can encourage that will help them on their journey. There is something in the grief for each of us. When we sit in it for a bit, we can find it, it's not wasted time.